Samsung introduces latest Smartphone Samsung Galaxy C7 Pro 2017 with fantastic features. It is good-looking hand-set with sleek and slim body structure. Users can easily bring this in pocket for going anywhere. It gives charming look of user’s personality by holding on hand and people easily attract for watching this Smartphone in different occasions. 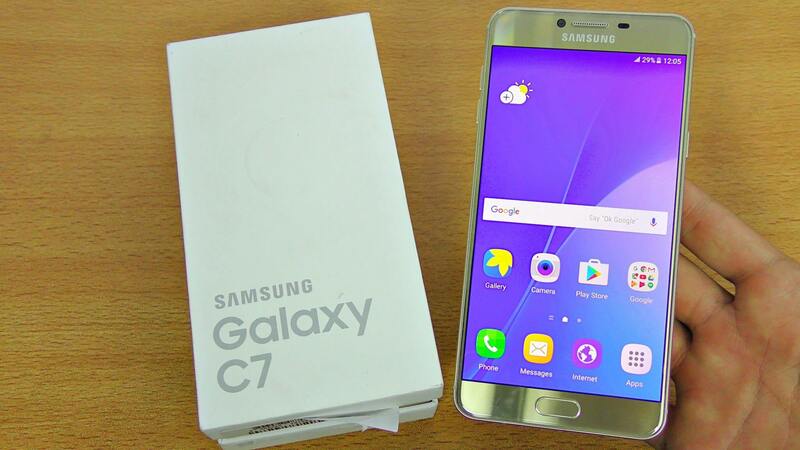 Galaxy C7 Pro provides all latest technologies for using with correctly. Android 6.0.1 Marshmallow up-gradable version is attached with Touch-Wiz UI system and it is giving Octa Core 2.2 GHz processor feature for using in this cellular phone. It is providing speedy processor system for doing multiple tasks without facing hanging problem. Samsung has attached exceptional camera option in this cellular phone and cellular users can avail 16.0 mega pixels rear and front camera option by buying this hand-set. As per trend in this modern era Selfie is really popular thing for capturing countless images so Samsung is providing 16.0 mega pixels for taking countless selfies through this feature. It is amazing Smartphone has launched by Samsung with astonishing incentives and users can give new look of his/her personality by buying this Smartphone. Get the complete specification details of this newly launched Samsung Smartphone from the below. System: Android 6.0.1 Marshmallow along with Touch-Wiz UI. Processor:Octa-Core 2.2 GHz and Qualcomm MSM8953 Snapdragon 625 feature. Network: GSM 850 / 900 / 1800 / 1900. Memory: 64 GB Built-In Memory. Rear Camera: 16.0 mega pixels (Dual-LED). Front Camera: 16.0 mega pixels (Touch-Focus). Display Screen Size: 5.7 Inches. Display Pixels: 1080 x 1920 pixels. Display Colors:Super AMOLED capacitive display touchscreen and 16M Colors. Bluetooth, Micro USB V2.0, A2DP, LE, GPRS, EDGE, WI-FI, WI-FI Direct, WI-FI Hotspot, WLAN, and NFC. Audio: FM Radio, 3.5mm audio jack, MP3, WAV Player, WMA Player, FLAC Player and Other multi-media players. Messages: SMS, MMS, E-Mail, IM and Push Mail. Ringtones: Downloadable, MP3, Polyphonic ringtones, WAV Files and Sound-recorded file. Other Features: Multi-touch display option, GPS Supported, A-GPS Supported, Dual-Band, GLONASS/BDS feature, Calendar, Speaker-phone, Nano-SIM, Photo/Video editor, Speedy Battery Charging option, Input Swype, Accelerometer sensor, Gyro sensor, Google Search and 386 PPI Display. Latest Features: Finger Print Front Mounted Sensor, External Micro SD storage up to 256GB, Dual-tone flash camera, Face-detection camera option, Proximity sensor, ANT Supported, Active noise cancellation via MIC, 50.9 GB user-accessible ROM and Compass sensor. Available Colors: Pink Gold, Blue and Golden. You may also like it: Samsung Galaxy A8. The content is strictly not allowed to be copied in any way.